Renders each of the selected layers separately. You might find it useful if layers represent different versions of an effect or different parts of an effect that you want to render as separate “passes” for flexibility in how they get composited. 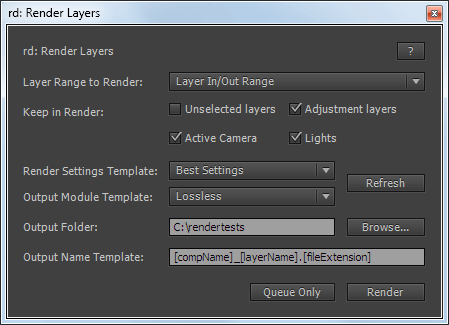 Rendering uses existing render settings and output module template, so be sure to create them beforehand. When you run it, you can select the templates to use; select the range of frames for each selected layer to render; control if unselected, adjustment, active camera, and light layers should be rendered as well; and define the name for each rendered output. Each rendered layer will generate separate “render finished” sounds. Enabled Queue Only mode for Layer In/Out Range.